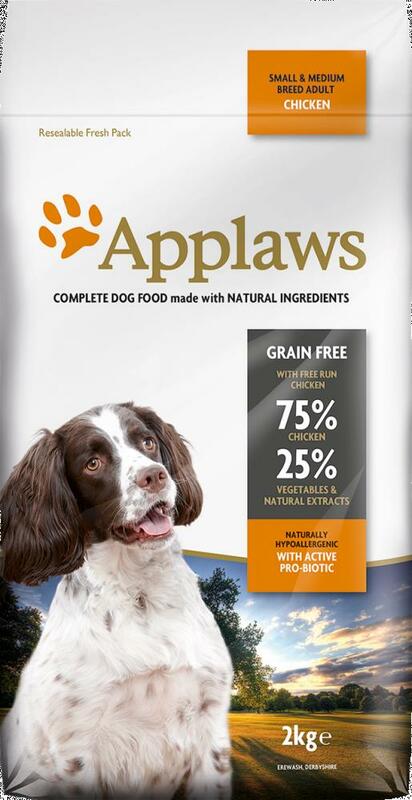 Applaws life-stage specific small/medium Adult dog food is completely free from cereals, grains and other cheap fillers. It also contains 75% human grade meat - up to three times as much as other super-premium dog foods; formulated with veterinarians, this tasty, palatable kibble is also enriched with DHA and EPA to aid the immune system & development of the brain. Trace Elements: Sodium Selenite 0.33 mg/kg, Calcium Iodate Anhydrous 3.26 mg/kg, Ferrous Sulphate Monohydrate 233 mg, Cupric Sulphate Pentahydrate 40 mg/kg, Manganous Sulphate Monohydrate 94 mg/kg, Zinc Sulphate Monohydrate 444 mg/kg. ; Natural Antioxidant: Mixed Tocopherols; Gut Flora Stabiliser: E1705 Enterococcus faecium cernelle 68 (SF68; NCIMB 10415) 1,000,000,000 cfu/kg. Protein 38% Crude Oils and Fats 20%, Crude Fibres 4.5%, Crude Ash 8.5%, Calcium 1.8%, Phosphorous 1.33%, Carbohydrates <23.5%. There are currently no questions for Applaws Adult Small & Medium Breed Dog Food - be the first to ask one!